"E ½ Lot 1 Con 6 - Originally the farm was granted by the crown to Samuel Humberston in January 1840. Samuel never lived here but rather sold the property quickly to Robert Armstrong and his wife Jane McElroy. Robert was a good man; quiet of voice and slow to anger. Jane had a lilting Irish brogue and was known for her hospitality and always wearing a black lace bonnet. Robert (born 19 Oct 1819) purchased a farm in 1851 at Lot 4 on the Mulmur-Tosorontio Townline in Tossorontio Township. In 1884 Robert sold the 100 acre farm to his son George Armstrong and his wife Ann Jane Brett – they had married in 1882. Together they raised seven children on that farm – Robert Henry, Minnie, Mabel, Georgina, Harry, Edith and Mary. George was known in the area for the amusing stories and anecdotes he had about early life in Rosemont. He was also an honourary member of Loyal Orange Lodge #9 in Rosemont. In 1934, one year before his death, George Armstrong passed the farm property on to his oldest son Robert Henry (known as Harry) and his daughter Mabel. Mabel had not been well as a child and spent a fair amount of time in a wheelchair. Harry never married. Selling the property to his children was George’s way of ensuring his children would always have an income. Harry and Mabel sold the farm to Robert William Madill and his wife Bernice Maharg in 1944 and in 1956 the Department of Highways took a piece off the SE corner of the property for a road deviation. Following the deviation the property sat vacant and “went wild”. The Department of Highways did not maintain it and had mostly forgotten about the property. The tree that was used to create ﻿﻿these bowls﻿﻿ was taken from outside the fence row lining the eastern edge of the property between the fields and the original Airport Road. 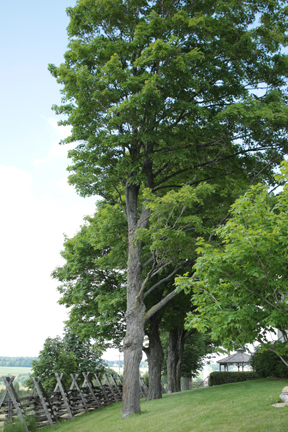 The row of old maples was planted by George Armstrong during his ownership of the farm and is at least 125 years old. The maple tree that was planted to replace the one on George Armstrong's original fence row. It seems like a decade or so ago that I was able to obtain the trunk of the first tree that the DCMA had to cut down from the fenceline. I took the tree to the sawmill and had it cut into boards. 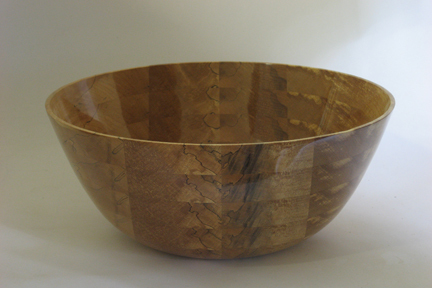 In 2012, I started making salad bowls from this material for the museum. As of this writing, I have now made 8 bowls and the ninth is ready to turn. From this tree I have been making my standard B-Bowls. These are, by far, my most popular salad bowls. You can read more about this style of bowl here. The video below shows part of the process in making one of these bowls. Here I start off by showing how I cut the half rings and finish showing how I glue the half rings together. When the rings are dry, I glue them vertically, one at a time until the bowl is complete and ready for the turning process. After turning, I sand and finish the piece, name it, write a synopsis of the story on the bottom and take a photograph. The bowl is then complete and ready for sale. Airport Road (the 6th Line) looking north. The old 6th line looking south. Now the DCMA parking lot. 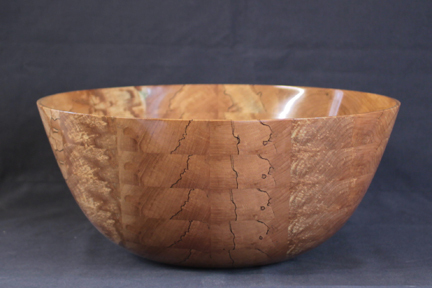 "Legacy", shown below was the first bowl made from George's tree. I called the piece on the left "A Sense of Time". I have planted trees in my life and watched them grow. They are a tangible living thing that connects us with those who went before and those who will come after.